Chicago glam rock outfit Smith Westerns have had quite a run with their brand of rock and roll that echoes not only vast influences from the sixties and seventies, but claws at the wall with wailing harmonies and finger cutting guitar riffs. 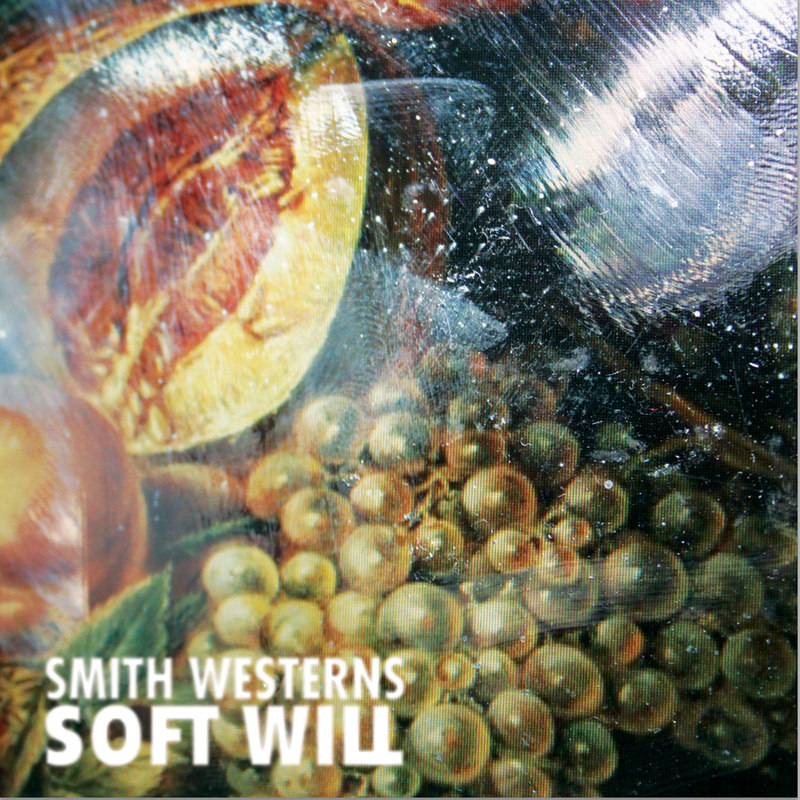 After two ruckus and wildly acclaimed records, the band returns with Soft Will, a gentler more subdued record that while inconsistent in intention for the most part presents a formidable second stage in the band’s already impressive career. Opening with “3AM Spiritual,” the song starts out with the simple strum and squeaking synth hook before escalating into one of those anthem inducing opening numbers that Brit Pop bands had a pension for doing in the nineties. A solid start that cools its jets considerably quick over the next three numbers climaxing with the Pink Floyd inspired “XXIII.” While the band was never going to be able to keep their tendancy for a glam rock sound stable over each album, it is dropped immensely here in favor of softer melodies that strum beautifully along. However, the momentum is much slower and eventually it just fades away. This isn’t to say it doesn’t get a chance to entice with brink neck back beats and gristle ladened guitar effects because it does and it’s great when it happens. The album’s third track “Glossed” grooves out of it’s subdued, melancholy shell with a solid mash of slide and finger picking guitar work. Stand out track and lead single “Varsity” is a power pop gem that is breezy and best played in the afterglow of the summer heat being both introspective and downtrodden all at once. The only disappointment here is the placement of the single, acting as the anchor that abruptly ends and closes out the record. Sequencing leads to strange results, as mentioned before, with the first 4 numbers but it’s also a rather subdued record at times. “Fool Proof” tries to rectified the solemn and experimental nature of the previous few tracks before going all quiet with “White Oath.” Singer Cullen Omori lyrically has expanded his views into a grander landscape that accents the vast frontier of Soft Will’s sound. Perpetually the college-age-partiers feel is mostly lost here and for logical reasons, considering the maturity that ranges in their sound here. The band is still living through their influences despite adjusting the guitar straps to something looser and less rough sounding. Beyond the aforementioned space opera tinge of “XXIII” you get the ride along, sing song nature of “Best Friend,” an easy like Sunday morning number that bops and beeps along like a good Oasis track flickering with some Beatles logic on the drumming and guitar parts. The traditional rock mentality of Smith Westerns has afforded them more credibility then most would get and that’s because they explore their upbringings and seldom riff off them creating their own impressive brand of music and that is still here in boat loads. When Soft Will wants to slip and slide with a gleam of sunshine, or even starlight, it coasts on fumes and it’s those lower points that allow the album to just drift away uninterested. The melodies swoon and the dreamscape of the work sounds lovely most of the time but it’s inconsistent when it tries to reach the fuzzy logic of the band’s previous work. That being said, it’s their most mature album to date and the effort is all there in the complexity of each number but it only takes the band so far. Soft Will is the album the band needed to do after two albums of bonafide Bolan/T Rex glory but it tends to be rather restrained at times allowing each track to unexpectedly fold into one another. This is by no means a bad record, in fact, Smith Westerns have clearly turned the corner on the next part of their career by departing greatly from their expectations and pursuing something that will give them longevity if they play their cards right.